​"PASSIONATE PURSUIT: After visiting the Brooklyn Flea in New York, Maria Tocco was inspired to start something similar in Providence and founded the Providence Flea LLC. Currently held on a parcel of the former I-195 land, Tocco hopes to eventually move to an indoor location to go year-round." "Warming up to the Flea"
"Shoppers enjoyed a respite from the cold while shopping at The Providence Flea Holiday Market at Hope High School on Sunday afternoon. The fourth annual Holiday Market featured goods from more than 80 local vendors, artisans and food vendors. The next Holiday Market will be held from 10 a.m. to 4 p.m. on Sunday, Dec. 18. The market is held indoors at Hope High School, 324 Hope St., in Providence." "And just when you thought you couldn't last one more day, The Providence Flea returns to South Water Street, beginning Sunday, June 5. Running throughout the summer along the Providence waterfront, this event showcases the best of local vintage vendors and artisans of handmade products, with live music and an assortment of food purveyors each Sunday." 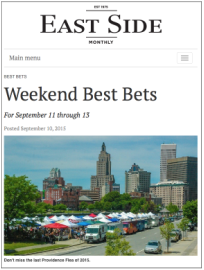 "Friday Five: Best of Providence"
"Lesser known than WaterFire, the Providence Flea market is another good reason to get into the city on summer weekends. Down the road from College Hill, this flea market hosts vendors who sell antiques and a number of upcycled products, like skateboard pens. It’s fun to take a walk around and see what they offer. At the very least, it’s a good way to start a Sunday visit into the city before heading to the RISD Museum, which is free Sundays. Make sure to haggle!" "Be Old Fashioned… in a Good Way"
"During the summer, the Providence Flea is one of the city’s unmissable events. On the weekends, vendors take over Water Street, selling beautifully curated vintage goods and handmade items. 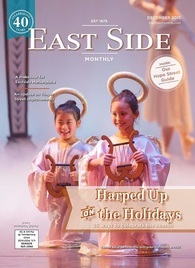 For the holidays, though, things move indoors: to Hope High School, specifically. The Providence Flea Holiday Market will take place on December 6 and 13, with food trucks and live music. It beats shopping at the mall any day. 324 Hope Street, Providence. www.providenceflea.com"
"Give Local Wrap up uniquely Rhody gifts"
"Local vintage enthusiasts suffer from a uniquely PVD version of SAD when the Providence Flea ends its glorious season at the end of each summer. Just in time to put some jolly in our holiday, the curated market is returning for the Providence Flea Holiday Market on December 6 and 13 at Hope High School. Get your retro and crafty fix as dozens of vendors showcase their unusual finds and handmade wares. Food trucks will also make an appearance, helping to fuel your hunt for a very thrifty Christmas. 10am-4pm. 324 Hope Street"
"Come out for the last Providence Flea of the season. Browse through kitschy antiques, vintage finds and local crafts by the water along South Water Street. As always, expect food trucks and live music. 10am-4pm. More info..."
"Five Can't Miss Events of the Week: Providence Flea"
"A flea market is the perfect place to find a dress that you can coolly describe to your friends as “vintage.” Providence Flea begins with a maze of clothing racks lined with mom jeans, sweaters and silky kimonos. 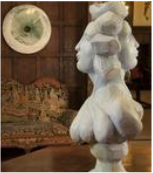 Peruse slowly and buy impulsively. As the fashionable Zooey Deschanel once said, “I go to different flea markets. I have lots of costumes. You never know when you're going to have to dress up like a milkmaid from the 1600s.” Continue onwards and you’ll find an array of knickknacks and trinkets to peruse through — an eggbeater here, a glass bottle collection there. After buying a vase, some records and a retro dress certain to score compliments, lumber over to the food trucks for an assortment of tasty dishes." "Good Day at the Market"
"The Providence Flea was open for business on Sunday on the Providence River Greenway. The weekly market wraps up for the season on Sept. 13. Aaron Maxwell, of Providence, and his daughters Cordelia, 4, and Daphne, 5 months, take a little break from the sun inside a wooden sculpture at Providence Flea. LEFT: Karen Fallows, of Woodbridge, Va., was visiting relatives, including her daughter, Kristin McMillen, and her granddaughter, Audrey McMillen, 4, who live in East Providence. They were checking out the vintage fire trucks brought over by Ralph Viara and his brother, Jim. The trucks...are from Jim’s collection in Seekonk. Phil and Maryann Brothers, of Syracuse, N.Y., view the vintage fire trucks at the flea market. Sitting in the driver’s seat is Ralph Viara." "View from the Booth - Providence Flea"
"Artful added a few new images to the Providence Flea 2015 album from the August 23rd flea market on along the Providence River. The summer show season is coming to an end soon. We’re taking a break next Sunday, but Artful will be back for the last two Providence Fleas on September 6th and September 13th." Get Out: Summer in the City"
"#1. July 5 - 26: It ain't your grandmother's flea market. Inspired by Brooklyn's funky flea markets, the Providence Flea adds flair to the creative Capital every Sunday in the summer, rain or shine. You never know what you'll find at the Providence Flea--and that's what makes it so irresistible. It's a juried outdoor market on the Providenc eRiver Greenway featuring a mix of antiques and handmade arts and crafts, as well as food truck on site. Free." "Discovering hand-made treasures — from painted scarves to decoupage to jewelry made of vintage fabrics — at this outdoor market is an inspiring way to spend an afternoon. Sun. from 10 a.m.-4 p.m. Providence River Greenway (across from 345 South Water St., Providence). (401) 484-7783, providenceflea.com." 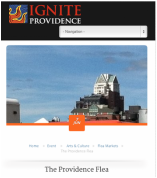 "The Official Blog of Waterfire Providence"
"Returning Outdoors June 7! Featuring all the cool vendors from last summer’s Flea plus a slate of new vendors for even more one-of-a-kind Flea finds! Shop Local this season at the Flea. Sign up for our e-news at www.providenceflea.com for more info and a sneak peek at upcoming vendors and special offers!" "Hundreds visit winter edition of Providence Flea Market"
"You couldn’t find a single Princess Anna doll, a Patriots sweatshirt or any other predictable Christmas gift at the Providence Flea market Sunday. What you could find, however, was a vintage Avon cologne bottle shaped like a ring-necked pheasant, funky jewelry transformed from old guitar strings, and..."
"The Providence Flea drew inspiration from the famed Brooklyn Flea, one of the hippest American destinations for people hunting vintage treasures. The Providence market provides everything the flea market fancier could desire, from offbeat finds and local crafts to 19th century antiques, as well as food trucks and a stellar view of the Providence River Greenway." "Number 3 - The Providence Flea"
"You're sure to find something to love at the Providence Flea at the last Flea of the season on Sunday, September 14. Don't miss this mashup of vintage goods, artisans and makers, food trucks and live music. We'll be sad to see you go, Providence Flea, but we'll be there on Sunday and we'll anxiously await your return next summer..."
"The Mix: Come See the Flea (through Sept. 14)"
"The Providence Flea, which is on the Providence River GGreenway, across from 345 South Water Street, features local artisans, vintage vendors, food trucks, live music and more every Sunday, 10 am - 4 pm, through Sept.14 , rain or shine. For more details, go to providence flea.com..."
"More people buying into Providence Flea’s lively outdoor market"
"A gray, overcast day didn’t seem to faze hundreds of people on Sunday who ventured out to The Providence Flea, a makeshift market on South Water Street where small businesses sell jewelry, handmade soap, salves, photographs and plenty of vintage goods from days gone by..."
"On Sunday, visit the Providence Flea from 10 am - 4 pm. Located on the scenic Providence River Greenway, the Providence Flea is modeled after the gargantuan Brooklyn Flea and it is a shimmering oasis of vintage goods, artisanal treats and fresh food. The Providence Flea is packed with old objects just waiting to be resurrected by a new owner. While the lineup of vendors rotates, you're guaranteed to find craftspeople with handmade wares. antiques and jewelry..."
Shout out to The Providence Flea, which is getting noticed far beyond our borders. "Shout out to The Providence Flea, which is getting noticed far beyond our borders. Yankee Magazine cited it in its Best of New England “Best Vintage Finds” category, saying, “Curator of cool, The Providence Flea is a juried outdoor urban flea market with a decidedly Brooklyn bent.” And Romantic Homes magazine named it among the best flea markets in our part of the country..."
"The Providence Flea is in the midst of its second season, transforming the Providence Greenway on South Water Street into a sprawling open market complete with food trucks, handcrafted art and antiquities ranging from old books to vintage firefighting equipment." "The Providence Flea is the state's premier weekly event for vintage and unique finds of all kinds. Listen to our conversation with the woman behind the operation, Maria Tocco." "No. 9 Providence, RI--After slipping three spots this year, the Rhode Island capital is perhaps trying to stage a quirky comeback with the recent debut of its new flea market on the Providence River Greenway." "Communications director for Lieutenant Governor Elizabeth Roberts by day and owner/organizer of the Providence Flea Market by night: that’s Maria Tocco." "Hundreds turned out to support the Providence Flea on Sunday, a market place filled with vintage clothes, furniture and collectables. Over 50 venders set up each Sunday. The market will continue until mid-September." "If you're looking for old tapes and knockoff handbags, you're out of luck." "We're so spoiled in Rhode Island! Arriving on the scene in early June this year, Providence Flea is the newest of the fabulous outdoor markets in Providence." "Flea markets are making a comeback, as evidenced by the success of The Davis Flea and The Providence Flea, both of which are hipper versions of your mother's flea, featuring vintage finds and eco-chic upcycled goods." "This Summer I’ve spent considerable time frolicking around the new Providence Flea here in Rhode Island. Like other vintage art fairs that came before them, they’ve dropped the word 'market' from the traditional name 'flea market,' and it essentially becomes a parade of art, antiques and vintage duds that hail from tiny independent vendors." "All summer long there will be this weekly Flea Market set up roadside along the Providence River every Sunday, which will offer a variety of handmade wares and unusual vintage clothing and art...it's worth it to pull over and park and walk around." "What’s better on a lazy Sunday than a riverside view, good company, and some great finds? I don’t know about you, but other than a Drag Brunch, I can’t think of anything that will top this." "Summer breezes in and out like a thief in the night, so you've got to make the most of each and every fleeting day..."
"Megan Graham, of Providence, peruses a rack of vintage clothing for sale at The Providence Flea, an upscale market on the Providence Greenway, on Sunday." "A new, upscale flea market is attracting crowds to downtown Providence on Sundays; it’s not your typical flea market." "This year marks the inaugural run of the Providence Flea, an outdoor market led by Maria Tocco, peddling fancy vintage items based on the Brooklyn Flea model." OPINION | EDITORIALS "River city flea market "
The Providence Journal Editorial page says, "This is a great new use for the waterfront..."
"Food Trucks Roll In At The Providence Flea"
"The Providence Flea- everyone knows that it’s about the vendors and the cool finds that are waiting for you there..."
Emily Gauvin "PROVIDENCE, R.I. (WPRI) – Maria Tocco’s inspiration to open an upscale flea market in Providence came from her experiences at the Brooklyn flea"
Emily Gauvin "PROVIDENCE, R.I. (WPRI) -- Vintage is all the rage at the Providence flea this summer"
Local food used in food trucks Emily Gauvin "PROVIDENCE, R.I. (WPRI) – The Providence Flea won’t just be home to great clothing and accessories this summer, but it will also host all kinds of food trucks equipped with delicious local dishes." "In the shadow of Providence’s skyline, along the opposite shore of the river, the charm of a summer in the city meets the swank of Rhode Island’s urban vintage culture at the newly opened Providence Flea." "Imagine my delight when, earlier this year, I found out that Providence would be getting its very own upscale flea market!" "Take the Brimfield Antique Show, cross it with a hipster art and crafts fair and you might get something similar to Providence Flea." Providence is about to get a little more like Brooklyn this weekend, when The Providence Flea, the city's first and only upscale urban flea market, will open for the season on Sunday, June 2. Five can’t-miss events of the week. "Inspired by the popular Brooklyn Flea in New York, this open air market celebrates the old and the new right here in Rhode Island."